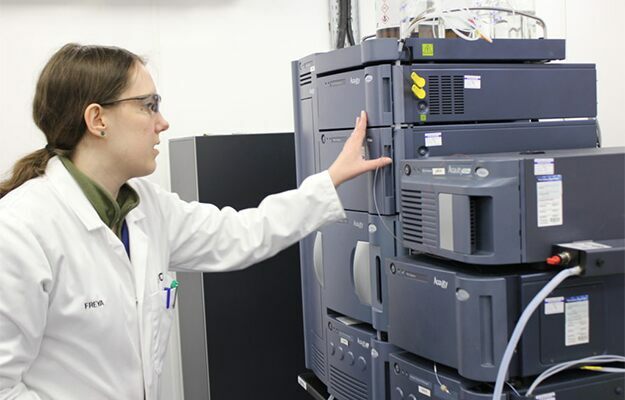 Waters UPLC systems with the ACQUITY QDa Mass Detector and informatics solutions enable pharmaceutical R&D teams to stay at the cutting edge of aerosol and inhalation drug delivery research at the Chiesi Group’s Chippenham laboratory in the UK. It’s becoming more important for pharmaceutical companies like the Chiesi Group to integrate forward-looking strategies to achieve excellence and use their growing knowledge to make decisions quickly. Dr David Lewis, Director of Aerosol Research at The Chiesi Group and co-inventor of 29 patents relating to pressurized metered dose inhaler formulations and devices, states that for a product to be launched in 5-10 years, they need to be 20-30 years ahead in their research. Chiesi Group believes that collaboration is key to success, this focus on entrepreneurial collaboration serves as the basis of the 10-year relationship between its researchers and Waters. Dr. Lewis believes that the partnership between Waters and the Chiesi Gropu serves as the basis for the company’s growing success. “The pharmaceutical industry needs to stay ahead of the game if they’re going to deliver tomorrow’s medicines,” says Dr. David Lewis at Chiesi Group. Quality instrumentation and software from Waters has allowed Chiesi scientists to maximize the applicability of their research and the innovations that result from it. Read more about how the relationship between Chiesi and Waters has enabled Dr. Lewis and his team to continue to push the boundaries of the drug discovery research process.